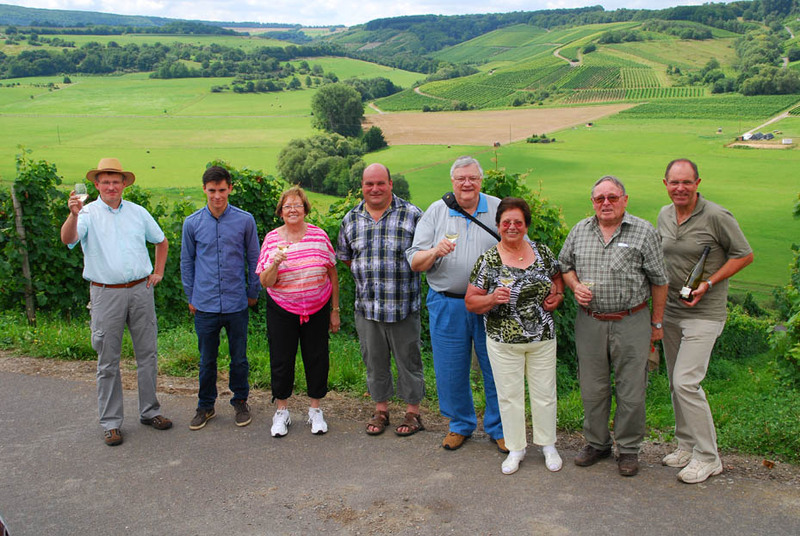 Thanks to exhaustive research carried out by our partner Roland Geiger (far left) our guests from Missouri were able to toast ancestors in a vineyard above Veldenz that was owned by them before they emigrated to America. Making it extra special was the fact that current-day cousins are also wine makers. Barbara is in the pink, Carl T. is in the blue pants. This photo was taken above Veldenz, Germany. Planning and coordination of this tour started in late August, 2013. Ancestors owned vineyards before they left for America. What a special treat to toast them with cousins on a gorgeous day. I want to thank you again for the great time we had, your work was excellent. I will never be able to thank you enough for putting me with Roland. I have heard from my Cousin Edgar and from Ernst in Stadthagen. I’ll let you know when I receive my wine and we can share a bottle in Springfield of Sarasota. Posted in Family History Tours, Germany Tours and tagged ancestral, custom, designed, family, genealogic, genealogy, history, mosel, private, tours, valley.